The Executive Director of the Friendship Ambassadors Foundation, Mr. Patrick Sciarratta called the event a historic moment; “young people are actively participating and promoting the changed on ground, tomorrow’s leaders.” He also appreciated the support of Microsoft, UNOP, UNF, UNAUSA and the Permanent Mission of Romania to the United Nations. In the two-day program, the delegates and young leaders had the wonderful opportunity to visit the Permanent Missions at the United Nations to know more about the countries’ perspectives and areas of work within the UN system. There were also plenary sessions, workshops, round table discussions, networking opportunities, new social venture competitions, and Millennium Development Goals related workshops. Since the last couple of years, I have been part of the team that organizes the Youth Assembly at the United Nations. I had wonderful experiences meeting my fellow young global citizens of the world who were full of energy, enthusiasm and passion to be the change, they wanted to see in the world. I think events like the Youth Assembly at the UN are great opportunities to raise the voices of young people. We must take a stand against all the problems in the world and work together for finding solutions of our problems. Young people shouldn’t wait for an opportunity to arrive but they should open a new door for themselves and engage their communities in the process. The United Nations Sustainable Development Goals can only be achieved if we, the young people stand side by side and shoulder to shoulder with each other and our leaders. We should make our governments accountable, challenge corruption, speak up against injustice and help the vulnerable communities. Yes, we can! The problems of the people in Africa, Asia, Europe, Americas, Australia or Antarctica shouldn’t be treated as their problem but as our problems and it’s our shared responsibilities to help each other, grow together and make the dream of achieving sustainable development true by leaving no one behind. 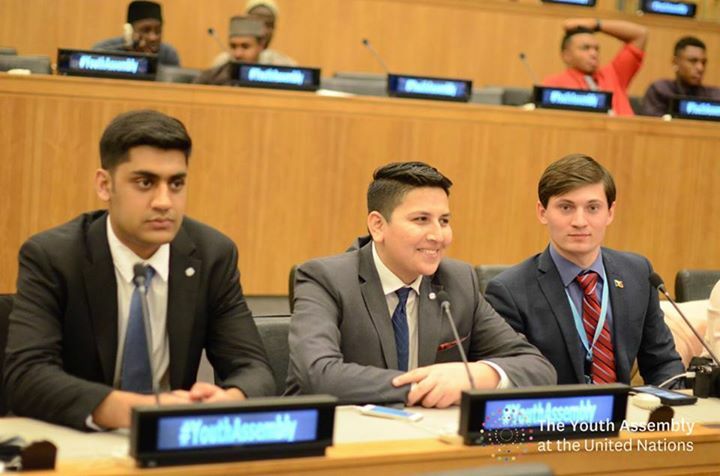 I hope to see many of these youth leaders making a positive change in their countries by influencing their own communities with the great learning and experience they had, here at the United Nations. Be the leader today and start doing with any idea, a small initiative and make your fellow global citizens proud of you. This article was also posted on UNICEF’s Voices of Youth here. This was really a great moment for young people. I want to congratulate those young people who think about the future and take responsible decisions.